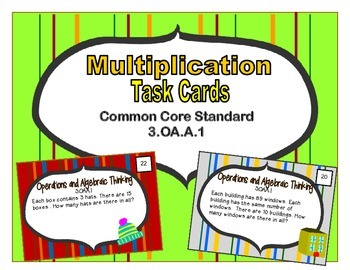 These 24 task cards cover Common Core Standard 3.OA.A.1 for multiplication and come with a printable box for storage too. 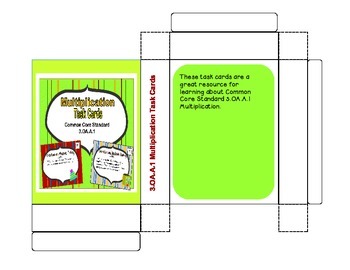 This is a great Common Core aligned math resource that provides students with practice with multiplication word problems. Some problems require regrouping and others do not. This is perfect for providing practice for students at different math levels within the classroom. 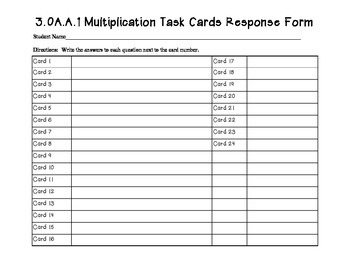 *Send home a printable box of review cards with a student that needs extra practice. *Use them during family math night. *Use them as a test prep activity. Click the follow button to get updates about freebies and additional resources.